Doesn’t the title sound appetizing already? When tomato season is upon us, it’s time to get creative to use all of the precious harvest. A great way to preserve the freshness for later (or right away! 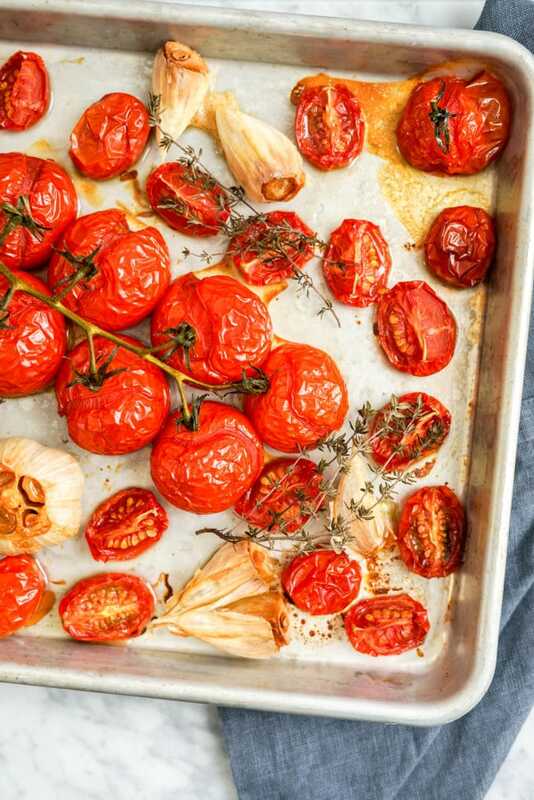 ), is by making this Simple Tomato and Garlic Confit! This can also be made at the end of the season, when tomatoes aren’t at their peak in flavour. You can use whatever tomatoes you have on hand, regular tomatoes, yellow tomatoes, cherry tomatoes, etc. 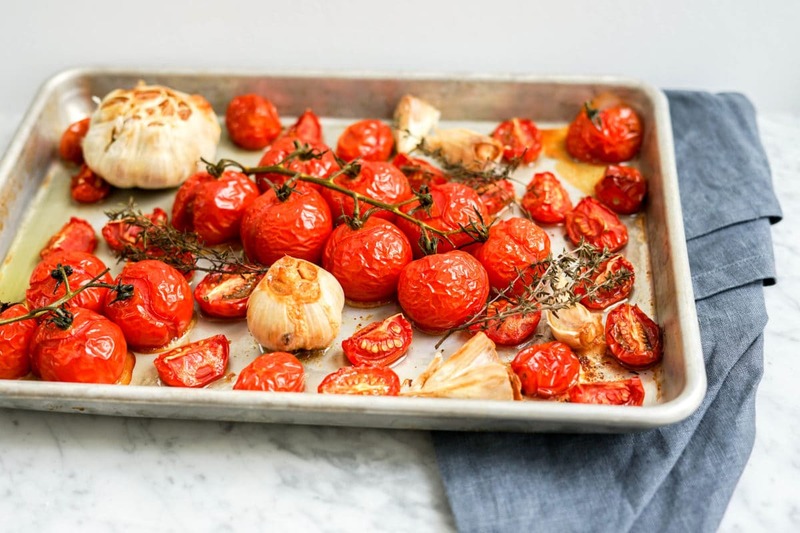 This Simple Tomato and Garlic Confit is an amazing addition to any summer or fall meals. You can use it on top of pasta and sautéed vegetables, on top of pizza, or on top of grilled fish or meat. You can even serve it as appetizers, on top of toasted fresh bread. Yum! 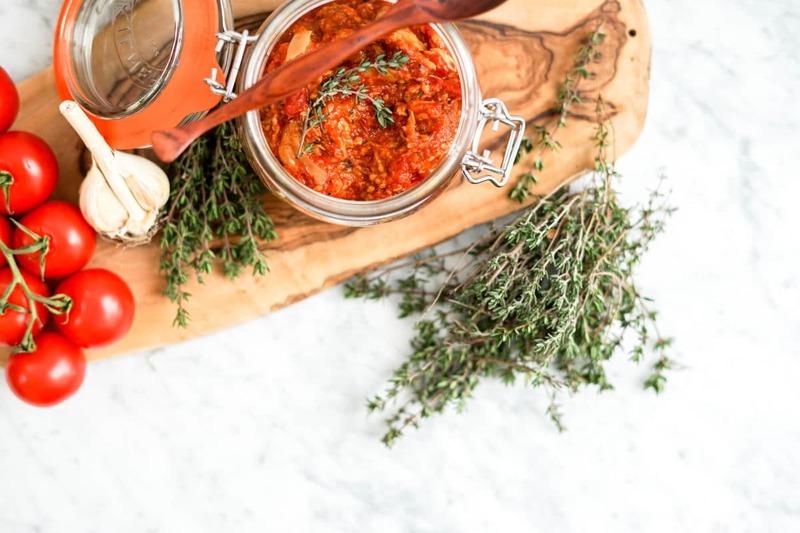 Did you know that cooked tomatoes contain more lycopene than raw? 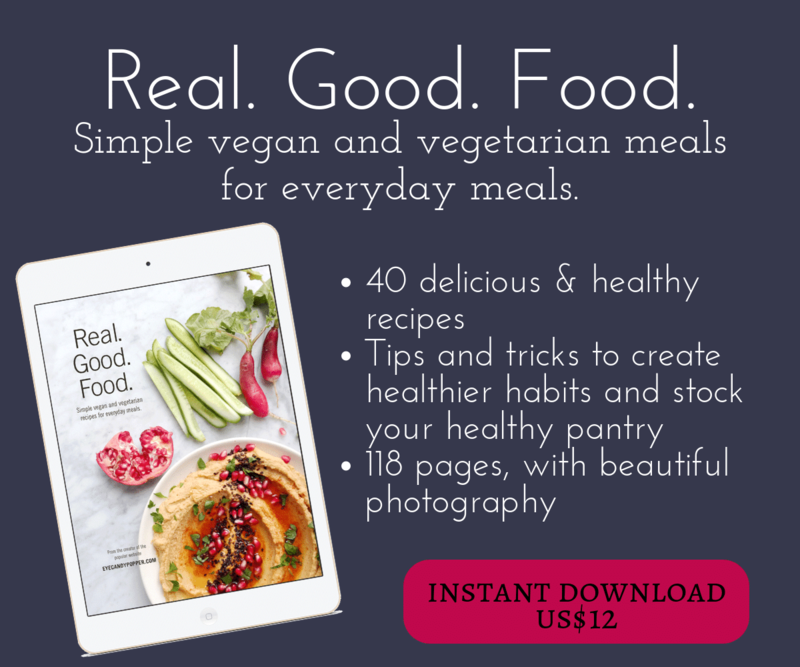 More often than not, it’s better to eat vegetables and fruits in their raw state in order to get full nutritional value, but sometimes it’s better to cook them, like tomatoes. 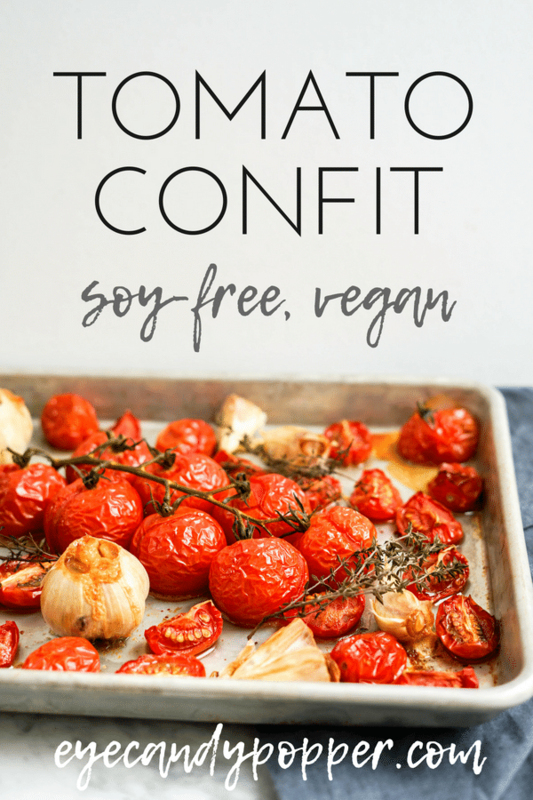 You can still enjoy them raw, of course, but remember that cooked tomatoes are pretty awesome too! Lycopene is yet another awesome antioxidant that can help your body prevent cancerous cells, it’s also shown some beneficial properties to fight infections, like candidiasis, and can help lower high blood pressure. Lycopene has even shown some benefits in relieving oxidative stress in bones, which is what can cause brittle bones and a weak bone structure. Of course, the addition of garlic in this recipe adds even more taste but also health benefits. It’s well-known that garlic is nothing short of amazing, with antiviral, antimicrobial, and antifungal properties. So all in all, tomatoes are pretty cool, and they’re also very easy to grow in a container, so anyone can try growing some, even if you only have a small balcony! 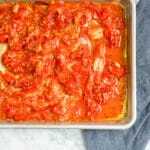 An easy way to preserve freshness during tomato season, and use on pasta, meat, or fish. Make sure to look for organic tomatoes and preferably, local. Wash and cut the tomatoes. 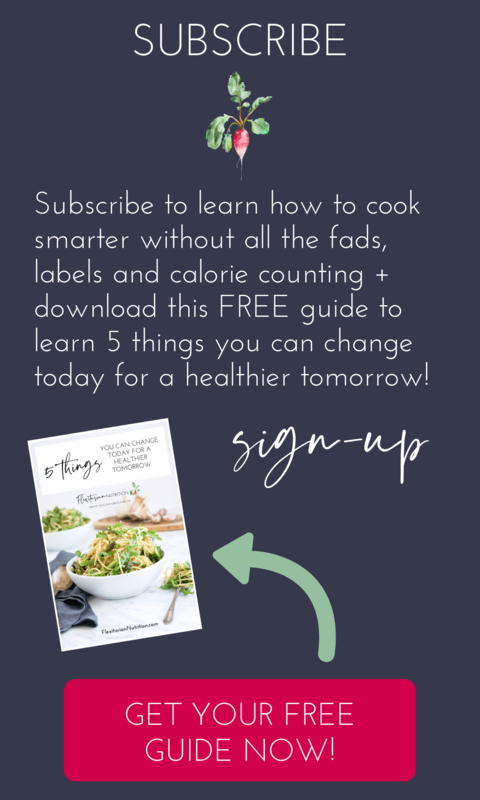 Place on a baking sheet lined with parchment paper. Cut the top of a whole garlic head and place on the baking sheet. Or separate each garlic clove (leave the skin on) and mix with the tomatoes. Generously drizzle with good quality olive oil, sprinkle the sea salt and spices all over. Put in oven and bake at 325F for about 45-60 minutes or so, depending on how roasted you want them to be, and how big your pieces of tomatoes were. Once cooked, simply push on the bottom of the garlic cloves and they should pop right out. You can then chop and mix with the tomatoes, making sure to scoop up all the yummy juices, herbs and oil. 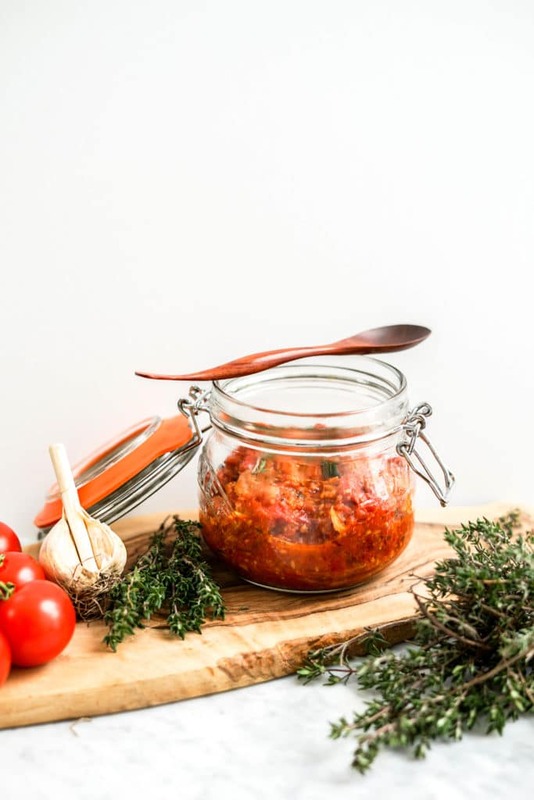 Store in an airtight container (like a mason jar) in the fridge for 2-3 weeks, or for later use, fill up the mason jars with the hot tomato garlic mixture, tighten the lids without forcing, carefully lower the closed jars in a large pot of boiling water, and boil for 12 minutes. Then remove from the heat and let cool down at room temperature. Tighten the lids once more before storing. This sounds amazing. Unfortunately, my tomato plants are a bust. Rather than ripening, they’re all rotting. I’m so disappointed. I may have to hit up a farmers market to give this recipe a try.